Cemeteries and graveyards can speak volumes about the history and traditions contained within a community. Memorials and gravestones can reveal much about a single person and his family as well. But, some markers and memorials simply represent stunning artworks to the objective observer. I’m often distracted by these sculptures as I wander through cemeteries in search for related ancestors. Some memorials, such as the Weeping Angel, can take my breath away. The Weeping Angel, also known as the Angel of Grief, is an elusive and rare sculptural specimen. Tradition states that sculptor and poet William Wetmore Story created the first Angel seen above, which serves as the gravestone for the artist and his wife at the Protestant Cemetery in Rome. The Stanford Mausoleum at Stanford University contains a replica created in 1906. This copy supposedly replaces another replica created in 1901 that was destroyed in the 1906 San Francisco earthquake. Other Weeping Angels have appeared in Brooklyn, New York, New Orleans, Indiana, Massachusetts, California, and St. Louis, Missouri. The angel is so exotic that recording artists Evanescence and Nightwish included her on their CD cover art (See notes at the end of this entry). Variations on the main theme have been seen as well. Einar Einarsson Kvaran captured the one shown here in York, Pennsylvania in 2006. 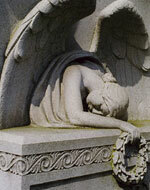 In my online search for the Weeping Angel and its variations, I came across several blogs written and maintained by genealogist and amateur photographer, Joe Beine. Beine’s genealogical methodology speaks for itself in his Genealogy Roots Blog, but I challenge his status as an amateur photographer. The photographs that he uses to illustrate his photoblogs about cemetery symbols and the Eyes Wide Open Exhibit in Denver show great empathy as well as a keen eye for depth of field. His images supply great detail and clarity, attributes that would enhance any study on cemetery symbology. Although the majority of Beine’s research contained in his Cemeteries and Cemetery Research site is limited to the Denver, Colorado area, the symbols that he focuses upon represent national reach. For instance, the most common symbol for the Freemasons (or Masons) shows a compass and a square with a letter “G” that stands either for “geometry” or for “God.” This symbol can be found on gravestones from Maine to California. Additionally, Beine’s avocation as a genealogist helps to steer his photographic eye to include details such as the tradition of leaving a pebble or stone on the top of a tombstone. The pebble serves as a signal that someone has honored the deceased with a visit to the graveside. Beine’s site, Fields of Peace, details his visit to the 2006 Eyes Wide Open exhibit in Denver. The significance behind these photos is that this “cemetery” is a temporary memorial to the soldiers and civilians who have died in the ongoing Iraq War. Like the AIDS Memorial Quilt, Eyes Wide Open grows with time and as it travels from city to city. But, unlike the rows of white stones that can numb the mind and blind the eye at Virginia’s Arlington National Cemetery, the variety of shoes and boots that are laid out in rows at the Eyes Wide Open exhibit are meant to startle the viewer into sober revelation. The American Friends Service Committee, a Quaker organization, created the Eyes Wide Open memorial exhibit in 2004, and the temporary cemetery has traveled to over fifteen states since that time. Each pair of boots honors one U.S. military casualty, and a field of shoes and a Wall of Remembrance memorializes the Iraqis killed in the conflict. A multimedia display explores the history, cost and consequences of the war as well. Although the Angel of Grief’s rarity and beauty seems to mitigate the tragedy that she embodies, the online search for her image that led to my discovery of the Iraqi War memorial seems ironic – or, at least poignant. On the other hand, since cemeteries and graveyards can speak volumes about the history and traditions contained within a community, the Eyes Wide Open exhibit merely mirrors one perspective on current world affairs. Most importantly, I’m grateful that the Weeping Angel led me to discover Joe Beine’s vibrant and living testaments about how Americans honor, remember, and memorialize their dead. Evanescence EP is the first EP from the rock band Evanescence. It was released by Amy Lee and Ben Moody at a concert in 1998 as an unmarked CD-R. Like their Sound Asleep EP, it is very rare, as only 100 copies were ever made. Now, that information is ironic if the reader considers that the angel on the cover is just as elusive. Evanescence is a rock/alternative/pop band that hails from Little Rock, Arkansas, USA. Once is the fifth album by Nightwish, released June 7, 2004 by Nuclear Blast Records. During the first week of its release, Once entered the German, Finnish, Norwegian and Greek charts as number one, selling over 80,000 copies in Germany alone. In May, “Nemo” was the first single to be released from this album, followed by “Wish I Had an Angel” in September. Nightwish is a Finnish symphonic metal band. The Angel on the Evenescence Album cover is from a weeping angel tombstone at a cemetery in Little Rock, Arkansas named Oakland Cemetery. Oakland Cemetery pre-dates the American Civil war and was established as a mainly German Cemetery for many of the notable ‘upper class’ citizens. There are many Gothic type tombstones located within the cemetery. You can see a copy of the weeping angel on my website.